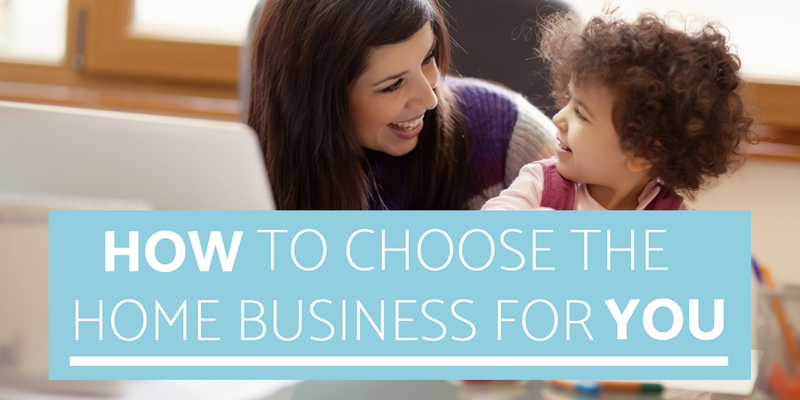 There are so many Home Business Opportunities out there; it can be hard to know which is the right one to choose. If you have never run a home business before, knowing what to look for in an opportunity can be a challenge, particularly when looking at network marketing options. To save you a lot of time and indecision, here are my top tips for finding the right company and opportunity for you so you can start your business with confidence. These tips are not specific to any one company, but if you are curious to know which company I choose to build my home business alongside, and why, you can visit the Your Future page…but first, check out these tips! If you are going to build a home business around a specific product or service, then make sure that it’s one that you love and would use even if it wasn't part of your business. To create authentic and lasting relationships with your customers and offer them the best service and advice, then you have to be using the products (or service) yourself. This not only gives you total confidence in them – it also gives your customers, and potential customers, confidence in them too! Whatever business you’re in, product volume is a central part of your ongoing success, so choose a product you genuinely love and can’t wait to share with others. We are fast learning that there are no guarantees when it comes to companies in the modern world. And this holds true within the network marketing world too, where many new companies fold within their first 7 years. If you want to build a stable home business that is going to support you and your family for many years to come, then you want to choose a company with an experienced leadership team, proven track record, and rock solid financial situation. Most companies matching this profile are very proud to share this information with you. Most people are motivated to start their own home business for the attractive financial rewards available, but this alone will not motivate your continued success. Take some time to think about the difference you want to make in this world. Also, consider the types of people you want to serve and then select a company that matches these desires. If you already have a business and you are looking for an additional revenue stream, then choosing a company with values that reflect those of your existing business is all the more important. You want your new offer to be credible and something that your existing clients will love as much as you do. 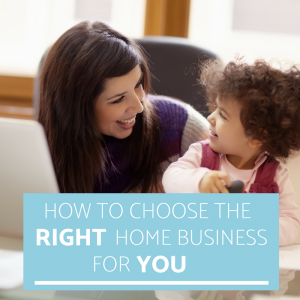 When the values of the company you choose to work alongside match your own, you’ll have a more authentic home business and be in a strong position to build lasting relationships with your clients. You will also find yourself much more motivated to invest the time and effort needed to achieve lasting success. Your sponsor can help you get your home business off to a flying start by providing you with some early guidance and support. I’ve heard network marketing described as ‘self-development with a pay cheque’ and I’d wholeheartedly agree with that. I feel like I’ve undergone an MBA with all the training, coaching and mentoring I’ve received – coupled with the opportunity to put everything into practice immediately. While you have to take responsibility for your own learning – no one can do it for you! – having a sponsor who inspires you, especially in the early days, can really help you get some traction into your home business quickly. This doesn’t mean that they have to be someone with years of experience – just someone who has the ‘get up and go’ and desire to help you while also building their own business. While most network marketing companies have a similar model, they all have some differences in their compensation plans. It’s important to take a bit of time to understand these so you can choose one that suits your style of working. For example, some companies have monthly targets that you need to hit or your lose part of your income or drop down to a lower-level of bonus; while some people thrive on this kind of incentive, for others, it’s too much pressure. Have a think about what motivates you and what you are willing to commit to in order to secure your home business success. Finding it hard to decide what to do? Making a decision that could potentially change everything is never easy. But I've prepared a post with some helpful tips and guidance on how you can make the right decisions every time. If you are looking for Home Business Success, I can help you in two ways. Firstly, I'd be delighted to share the details of the company that I chose to start my business with. They are one of the most generous and well-established network marketing businesses in the World, and they have a huge global presence and opportunity. As your sponsor, I will share you with a kick-start program along with personal meetings for your first 3-months to help you learn everything you need to get started. By understanding your personal goals, I'll help you designed the right approach for your needs and situation. For those with ambition to grow a thriving business, I also offer a free ongoing personal coaching and mentorship program. Contact me to discuss starting your home business. This is a 5-Day program that teaches you the secrets to success BEFORE you start your business. Over the five days, it helps you build the mindset, confidence and clarity you need to start a successful business in any industry. Well done summary! Switching the business to be run from home can be a bit of challenge. It is good that it is coming more and more common and bloggers raise this topic. So far, I am kind of halfway to independently working from home. Hope your article would inspire more people. Thanks Alexander – as you rightly say, it’s not always an easy transition, but if you know how to prepare yourself then there are lots of upsides to having your own home business. Good luck with your own home business journey! Great advice, thank you! Your first tip about picking something you care about is really important. The more you enjoy something, the less it feels like work. You’re so right Amber, I almost feel like I’m cheating as I enjoy my work so much – but if it’s not fun, then there’s no point. Thanks for teaching me aspects of home-based business I never knew to consider. I like that you cover ground that’s not typical, too. Thanks Jo, so glad you found it helpful. This was so great! I’ve been struggling with this for awhile- trying to figure out where and how to start. Looking for the freedom of time opposed to the comfort of steady traditional in one is a tough balance. Thanks for the advice all in one place! Having worked from home for years, I think that you have put together an well thought out list. Passion, your why, and the right people make quite he difference. I loved this list. As a current college student studying marketing, I especially liked the bonus marketing tips at the bottom! They can really be applied to anything from blogging to selling products. Not giving up at the No’s is something I needed to hear today! I never realized how real the fear of failure/rejection is until I started a blog. Thanks for the advice!! Thanks Gabriella, I’m glad you found the post helpful. When you have your own business, you do need to develop a bit of a thick skin and remember that rejection isn’t personal – you don’t buy everything you look at in the supermarket and we frequently go into a shop, take a look around and leave without making a purchase – it’s just normal buying behaviour and it applies to everything. It takes a while, but you’ll get there. Good luck and remember to have lots of fun along the way! Good solid set of tips. As someone who works for themselves and often from home or on the road, it’s Important to choose as business that you enjoy and believe in. You’re right, it’s so important to love what you do. Thanks for sharing your experience. This is such a helpful article. I would love to switch to working from home or working anywhere as long as I have my laptop. It’s important to do what you love! Thanks for sharing. Thanks Lauryn, so pleased you found the post helpful and I wish you every success with your own home business journey – drop me a line if I can be of help. I liked your interesting point about financial gain not being the continued motivator for success. For that you need to find values you believe in. Thanks Rachel. Often people forget to think about their values enough. Usually the things we admire or dislike most in businesses and other people can show us what our own personal values are. It’s actually a nice and helpful piece of info. I am glad that you shared this useful information with us. Please keep us up to date like this. Thanks for sharing.